HQhost Review 2019: Is HQhost a Good Hosting? HQhost is a U.K. based business offering SSD hosting. The plans are affordable, however, you may not get all the features on your wish-list. HQhost has been in business since 2001 and currently has more than 30 employees. It claims some of its customers have been with the company since its inception. I can’t confirm this, either way, however, I can dig into the English language website to see if it’s a good option for your hosting needs. 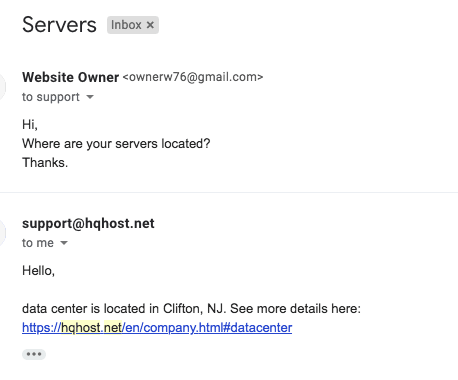 HQhost has its servers co-located in a Tier III data center in Clifton, New Jersey, just a short distance outside of New York. The routers are robust Cisco and the network is based on the BGP4 protocol in order to provide low latency and reliability. Other branded equipment includes Dell Racks, Cisco switches, and Supermicro servers. It’s also good to see the ten times as fast SSD storage is used, as opposed to older and slower HDD. There’s a 100% uptime guarantee advertised, although it’s less clear what the actual compensation is in the event of excessive downtime. Also, backups are only taken on a weekly basis, which may or may not be enough for your needs. The plans come with one-click support for popular CMS programs like WordPress and Joomla!, although it’s less clear from the website if there’s a website building tool (there isn’t one advertised). Unless you opt for an unlimited plan, the prices are all quite affordable. Also, unless you want more than three domains, you can easily get by with one of the two base plans, which are very cheap. There’s a 30-day money-back guarantee on all plans. To sign up, you first need to fill out a short online form. It’s a little bit buggy, however, I managed to get through it. Once complete, you have access to a dashboard and can purchase hosting in monthly terms. Customer service is available by phone, Skype, email, and online contact form. There isn’t live chat or a knowledge base, but according to the website, support is available 24/7. I did send the team an email around lunchtime on a weekday and I received a reply in full on the same business day. The team were helpful and polite. HQhost apparently only works with Level 3 providers like AboveNet, Highwinds, and XO, which is why it claims to offer 100% uptime. The plans are well-priced, however, the features aren’t endless. Wondering how HQhost stacks up against other Web Hosting companies? Enter any other Web Hosting company and we will give you a side-by-side comparison.